Written by Sebastian Stuart-Banks on July 27, 2017 . 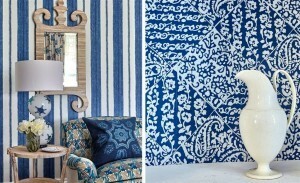 Posted in Homeposts, Interior design, New Collections. 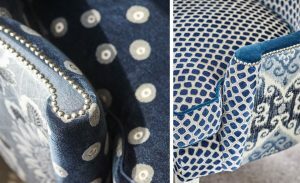 William Yeoward has produced and launched three new collections for AW17, The Interior Studio takes a look inside. 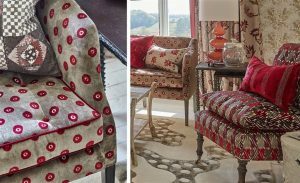 William Yeoward has launched a new collection of cut-pile velvets and weaves comprising sumptuous berry, mustard and denim colourways in William Yeoward’s trademark geometric and abstract designs. 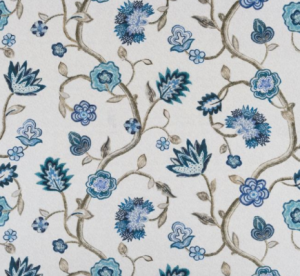 One of our favourite designs featuring in the Larkin collection is the Fenelle Rose design. The design describes dual-toned geometric spots that differ slightly in size to give a more natural and nonchalant impression. Inspired by a voyage to Spain, William Yeoward has produced a classic here which is so dexterous in its application. 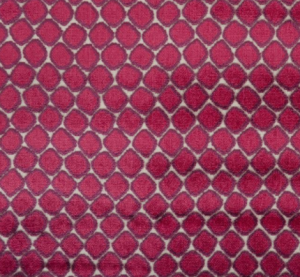 Fenelle velvet weave will be perfect for upholstery of all pieces as well as for cushion backs. 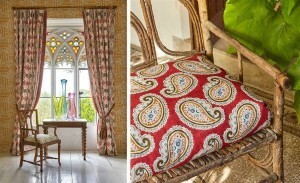 Pellenport fabrics comprises sophisticated and decorative prints, weaves and embroideries. 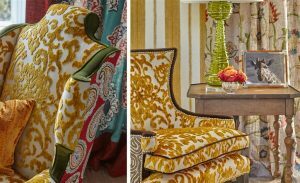 Inspired by travels across Europe, William Yeoward has accomplished the transition from traditional inspirations, authentic in style, to modern and on trend designs that have multiple applications. Below is a selection of photos from the Pellenport collection launch, and as you can see, William Yeoward’s influence and style is clear to see. 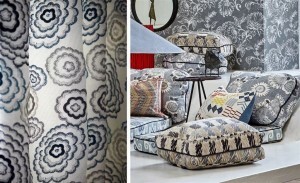 Using abstract designs with pastel colours and techniques, the collection offers much in the way of choice and flexibility. 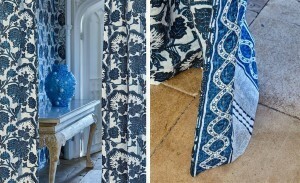 A personal favourite of Suzanne, Lily Peacock is a beautiful fabric oozing elegance and class. Supposedly inspired by travels across Europe, William Yeoward has modernised an authentic and dignified portrayal of spring/summer floral blooming. The material is a viscose linen which therefore would lend itself wonderfully for use in curtains and bedcovers. 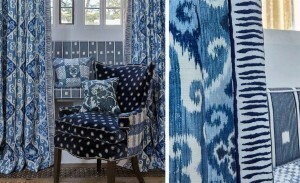 The blend of Ink and denim hues makes this particular colourway very captivating and pleasant on the eye. 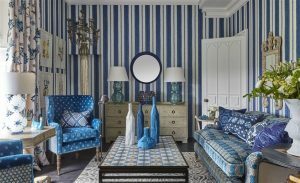 The final piece to the AW17 trio is William Yeoward’s Philippine wallpapers collection. 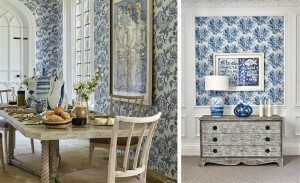 When going through this collection of wallpapers, one is immediately drawn to the scale of the prints. 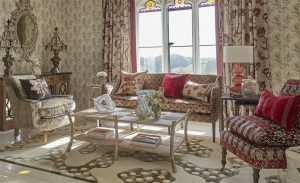 An extremely successful and impressive trio of collections by William Yeoward, confirming that this is a designer at the top of the game within the Interior Design industry. 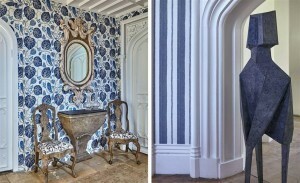 A style that remains true and consistent; abstract and geometric, making the use of these collections very flexible. 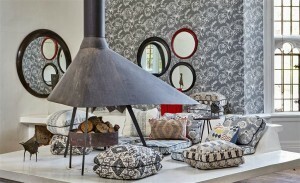 The Interior Studio is a stockist of all of William Yeoward’s collections. To enquire about the latests in his range, contact us today or come into our showroom in Budleigh Salterton.